Casa Del Sol has an amazing location and design. It’s close to Orient Beach, tennis, and water sports, and also has really great views. Three of the four bedrooms open to the gorgeous sun deck and gardens, and the fourth bedroom is a kid-friendly twin suite. You can vacation in bliss with your family or friends at Casa Del Sol. Casa Del Sol faces the sea on top of a hill above Orient Beach. 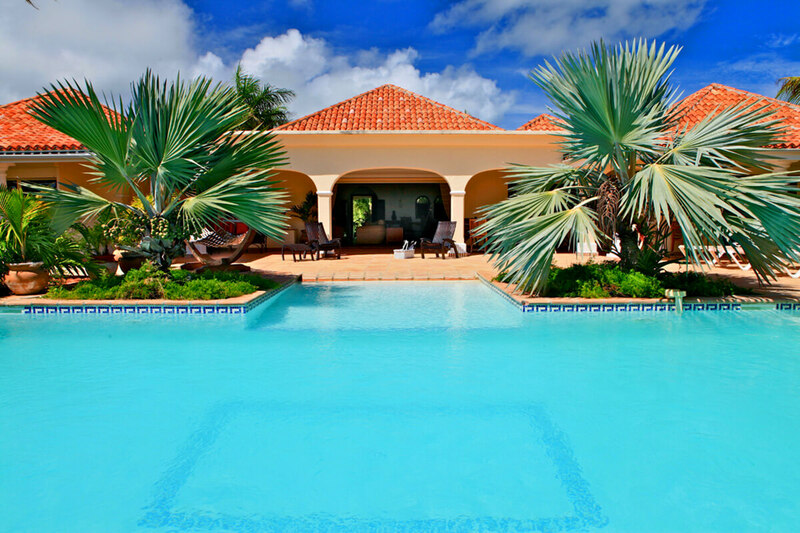 This villa is perfect for friends traveling together, although it also has ample amenities for babies and children. The villa offers ample living space inside and out. The sun deck and tropical gardens provide plenty of space to relax, and the pool was designed with families in mind. Adults can swim laps while children splash in the wading area, or the whole group can jump in for a party. Loungers line the side of the pool and palm trees waving overhead. A hammock sits off to the side for afternoon naps. There’s hardly any need to go inside, as the veranda shades an oversized sectional, long dining table, pancha-style BBQ grill, and pass-through window to the kitchen. In fact, the entire kitchen opens to the veranda. With stainless steel appliances, two refrigerators, coffeemakers, an electric kettle, and a wine cellar, the kitchen is prepared for any feast. The living room also opens to the veranda, and has a flatscreen TV and rattan furnishings that add a classically Caribbean vibe. Casa Del Sol has four bedrooms that each have an ensuite bathroom and air-conditioning. Two suites have king beds, one has a queen bed, and the fourth has two twin beds. The king suites both have exterior access - one opens to the gardens and the other opens to the sun deck. The queen suite opens to the deck and gardens. Casa Del Sol has something for everyone, with water sports, the beach, and tennis nearby. Orient Beach has several bars, snorkeling spots, and live music. 10 minute walk to Orient beach or a couple minutes drive.